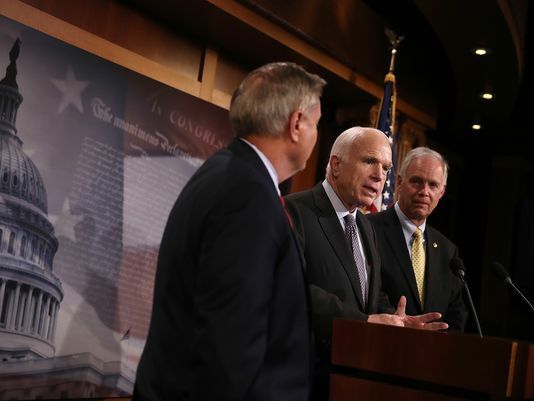 By Tom Kertscher on Thursday, August 10th, 2017 at 1:03 p.m.
Two radio talk show hosts were having a friendly interview with Wisconsin’s Ron Johnson when one of them was startled by a comment Johnson made about a fellow Republican U.S. senator, Arizona’s John McCain. 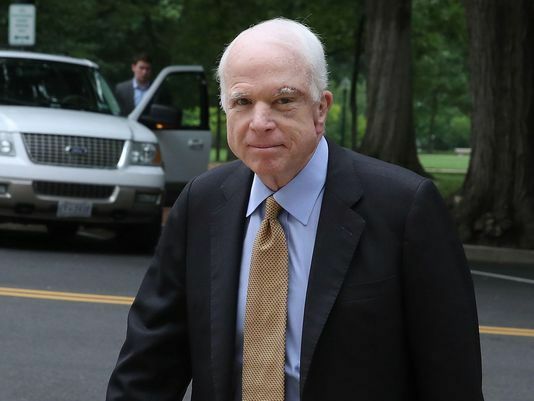 The result was a spate of headlines that led Johnson to walk back comments linking McCain’s brain cancer to a McCain vote that set back GOP efforts to repeal and replace the Affordable Care Act. The interview, on "Chicago’s Morning Answer" on WIND-AM, was done on Aug. 8, 2017. Eleven days earlier, McCain had cast the deciding vote killing one of the Republican measures, known as the "skinny repeal." It would have repealed the Obamacare mandates that most individuals have health insurance and that large employers cover their employees, among other provisions. That left in question whether Republicans can achieve their goal of a full repeal and replacement. Here’s our In Context look at what Johnson said about McCain and the skinny repeal vote, including the interjection by co-host Amy Jacobson, and what Johnson and others said afterward. The portion of the interview about McCain and his condition was brief. Johnson: I’m not going to speak for John McCain. You know, he has a brain tumor right now. That vote occurred at 1:30 in the morning. Some of that might have factored in. Jacobson: Really? I mean, he did get out -- he just had recovered from getting the brain tumor removed and then flew all the way to Washington, D.C. But you really think that that played a factor in his judgment call? Johnson: Again, I don’t know exactly what -- we really thought that -- again, I don’t want to speak for any senator. I really thought John was going to vote yes to send that to conference at 10:30 at night. By about 1-1:30, he voted no. So, you’d have to talk to John about what was on his mind. The day after the interview, CNN was the first to report on Johnson’s comments. Later that day, there were these reactions. McCain spokeswoman Julie Tarallo (in a statement to CNN): It is bizarre and deeply unfortunate that Senator Johnson would question the judgment of a colleague and friend. Senator McCain has been very open and clear about the reasons for his vote. Johnson (in a statement): I'm disappointed I didn't more eloquently express my sympathy for what Senator McCain is going through. I have nothing but respect for him and the vote came at the end of a long day for everyone. Two days after the interview, Johnson was asked in an interview with Chris Cuomo, host of CNN’s "New Day" show, about his remarks. Cuomo: What did you mean about John McCain? What did you not mean? Johnson: First of all, I have the deepest respect for John McCain. And in no way -- in no way was I trying to criticize him. If anything, I was trying to defend his position. A lot of us had a real problem with that skinny repeal and we weren’t going to vote for it until we got that assurance from Paul (Ryan). So, listen, I was trying to defend his position and truthfully just express my sympathy for his health condition. So, again, I’ve reached out to John, I'm hoping to talk to him today. I just have the greatest respect for John McCain. Cuomo: And to be clear, do you believe -- despite the fight that John McCain’s going to fight in a way none of us could -- do you believe that he’s on his game? Do you believe that his cancer should be an issue? Johnson: No. Absolutely. We held a press conference. And that had -- listen, I was just expressing sympathy for his condition. You know, 1:30 -- you know, again, no, I've got the greatest respect for John McCain. He's not impaired in any way, shape or form.